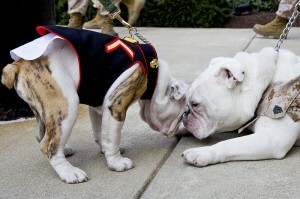 Marine Corps mascot Pfc Chesty XIV nuzzles against outgoing Marine Corps mascot Sgt Chesty XIII. English bulldogs have been mascots with the Marine Corps since the 1950s. The name ‘Chesty’ is in honour of General Lewis ‘Chesty’ Puller. 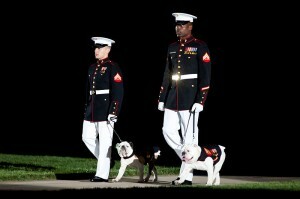 This entry was posted in Vignette and tagged Chesty, mascot, US Marine Corps. Bookmark the permalink.